Preparation : Fresh leafy shoots are normally crushed for juice. Juice is mixed with common salt or honey. Leaf powder is used for many purposes. Fresh leaf is used for fresh juice. Dried plant part is also useful. Leaf/shoot is used in garnishing fried peas and mango chutney.Leaves soaked with water for infusion. 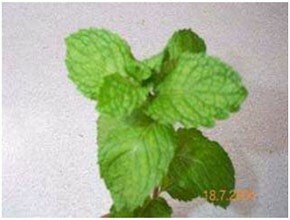 Ingredients : Plant is a source of an essential oil called spearmint oil (a colourless, yellow or greenish yellow liquid with characteristic odour). Constituent of the oil is L-carvone, terpenes, cineole, traces of a – pinene, phellandrene and dihydrocarveol and its esters. 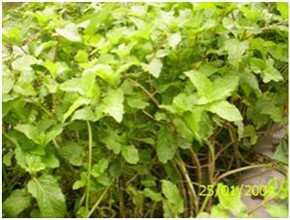 Ailment Treated : Leaves are used in fever and bronchitis. Leaf infusion is given in vomiting during pregnancy and hysteria. Oil is reported used for flavouring tooth paste and other pharmaceutical preparations. Leaf juice along with common salt is taken again cough and cold. Source : Generally cultivated in both hills and valley areas particularly in home gardens.